The Empire Hotel and Country Club is located just fifteen minutes from Brunei International Airport by road and just twenty minutes from the business district or Bandar Ser Begwan the country’s capital. Royal Brunei Airlines fly into Brunei from 23 cities and other airlines that service Brunei include Malaysian, Singapore and Thai Airlines. Situated in Brunei, on the doorstep or the world’s oldest rainforest of Borneo, sits the luxury five star resort, The Empire Hotel and Country Club. This magnificent hotel has repeatedly been voted Asia’s leading Golf Resort and Brunei’s leading hotel in the World Travel awards. This luxury resort has 359 spacious hotel rooms as well as 61 luxurious suites and private villas, which include the world famous Empire Suite, one of the most exclusive hotel rooms on earth and fit for royalty. The hotel is surrounded by 445 acres of tropical gardens and has eight swimming pools, an eighteen hole golf course, as well as a driving range and cinema. 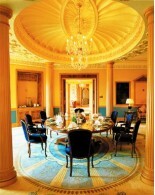 The Empire Hotel and Country Club is decorated with the finest of furnishings which are evident throughout the hotel. 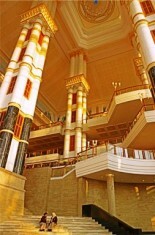 The towering Atrium is supported by white marble pillars accented with gold and the rails of it sweeping staircases are inlaid with 370 tiger eye pieces. No expense has been spared and other precious objects d’art include: Baccarat crystal, gold camels and limited edition Murano vases. The Empires signature restaurant, Spaghettini, is an exceptional Italian fare and as well as its dining experience guests can also choose from Pantai Restaurant, set by the beach and poolside, or the Li Gong Chinese Restaurant known for its exquisite Cantonese cuisine. The Atrium Café is popular for casual dining and lunch. 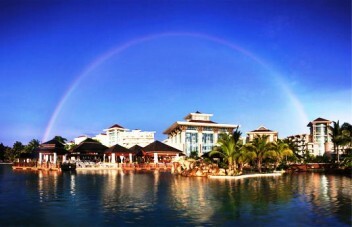 The Empire Hotel and Country Club is a resort oasis that provides its guests with an astounding choice of activities. Water-sports activities include: Swimming in one of the resorts eight swimming pools, windsurfing and parasailing, jet-skis, sailing dinghies and catamarans and kayaking. Brunei also has fantastic diving and snorkeling opportunities; for example at different times throughout the year you can experience diving with a Whale Shark. Other activities include: Tennis, squash, ten-pin bowling, gymnasium, badminton, snooker and billiards, eighteen hole golf course, golf driving range, shopping at the resorts own arcade, as well Spa treatments in the resorts private spa. The resort even has its own Cinema and theatre for live performances. If you have children the resort will cater especially to them and provides a kids club so that they are entertained and looked after by experts while you enjoy a break and relax in the resort.